With the Eid holidays coming closer, as most people frantically decide on the perfect outfit, perfect shoes and a purse to match the set, music lovers all over the country await eagerly the yearly Eid music releases in the country. With a bunch of new age musicians starting from the fusion mixes of Habib to a G series rock band, listeners of all kinds are hoping to get a taste of their favourite musicians this coming Eid. For the musicians as well, the occasion of Eid is filled with options and choices to make. In a country where the concept of technology, social norms and even the mere idea of survival are still developing, music in Bangladesh is ever budding as well. Gone are the days when musical legends like Abbasuddin would sing into a microphone along with an orchestra of traditional instruments. Today, recording methods happen to be a little more unconventional. To a musician, sound quality happens to be the most important element in the entire recording process. Over the past few decades, along with an increase in basic computer literacy, introduction of modern technology in our day to day life, recording facilities, in terms of music, have come a long way as well. Computer software programmes have now taken the place of recording hardware systems. Not only does this take less space, it is also much more affordable. Digital recording has changed the philosophy of music creation. “Music making has definitely come a long way with the help of computer software programmes and digital recording facilities,” says Foad Nasser Babu, famous musician and composer. 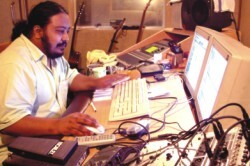 “These facilities provide one with access to a whole lot of options, simple techniques like cut and paste, creating a particular ambience over the vocals or a piece of composition, even working with the texture of sound.” Foad himself has been using the software ProTools for recording purposes for the past few years at Art of Noise situated at Shegun Bagicha. 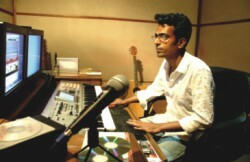 Owned by him and a few others, Art of Noise is one of the best studios in Dhaka with an excellent digital sound output. Although Foad and Bappa both speak up for the digitalisation of creating music, according to them, nothing beats the good old-fashioned analog recording. “The sound-signals received while recording in the analog studios had a full-fledged, round feeling,” says Bappa, trying to describe the analog system of naturally capturing the texture of vocals and other instruments while recording. “The warmth of the sound created is always missing in digital recording, which was one of the most significant traits of analog recording system,” says Foad. Buno working at his studio, Dhun. If given the chance, he would build an analog studio for himself. “Older studios equipped with analog boards and massive outboard gear, such as tube compression, spools, reverb, gate, noise reduction units, etc had their advantages and disadvantages,” says Fuad Al-Muqtadir, the 26-year-old composer all the way from New York City. “Analog recordings are warm, transfer more depth, sound more realistic and thicker than digital recording. However, noise is the biggest enemy of analog rigs. The more physical gear (as opposed to plug ins) you have, the more wiring you're dealing with. Accordingly, more wires mean more noise. Analog studios also required a lot of money to build. With a digital recording, even the cheapest CD player sounds good if played through good speakers. With analog, the more you pay for a piece of equipment, the better it will sound. 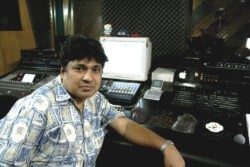 Analog Studios also required a lot of space since every processor and device was a separate unit.” Brought up in New York after moving with his family from Chittagong at a very young age, Fuad's passion for music led to him to working with a lot of musicians from Bangladesh, Canada and the US. Using Nuendo, the basic recording software, Fuad has come up with a number of projects created digitally, namely Maya, Maya II and very recently Variation 25. Foad Nasser Babu posing at the Art of Noise, one of the most popular digital studios in Dhaka. With more and more technical know how being introduced into the industry, revolutionary changes are taking place in the way music is created and recorded. The sounds of music could not get any sweeter.